I made a wedding card using plaid fabric, lots of bling, and the colors of the couple’s alma mater. Here are the DIY instructions for making monogram cards with a little bling yourself. 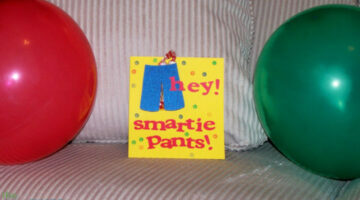 A sweet idea for kids Valentine cards and Birthday cards is to stuff Smarties candies inside! Here’s a template plus tips for making candy cards yourself. 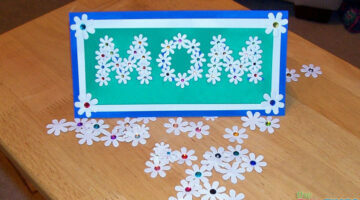 Flower your mother with love by making this colorful MOM card for Mother’s Day! 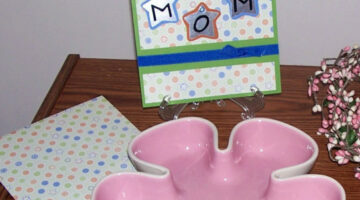 DIY instructions to make a mothers day card yourself. This fun spotted Easter egg card has a cute little surprise inside… It’s a peekaboo card! See how to make this adorable card with bunny ears and a cracked egg that gives a peek-a-boo surprise. Missed someone’s birthday? Here is a cute Belated Birthday card that I keep on hand for missed birthdays. 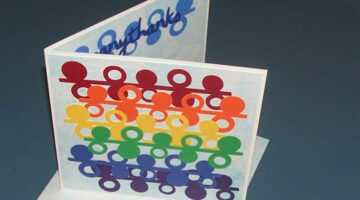 See how to make a Belated Birthday card yourself. 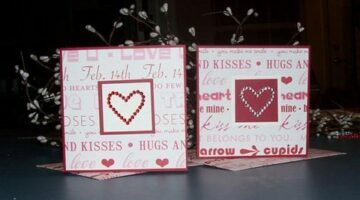 Make Your Own Valentine’s Day Cards: 2 Super Quick & Easy Valentine Card Ideas! Here’s how to make your own Valentine’s Day cards in a hurry… plus matching envelopes! Have some old Christmas gift tags leftover from holidays past? Here’s how to use them to make your own holiday cards this year. Lots of DIY Christmas card ideas here! 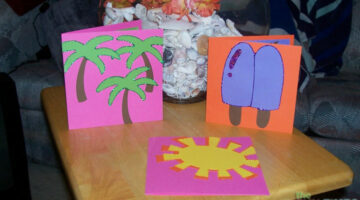 Want to make a fun card for Dad’s special day? This unique Dad card is sure to let him know how much you care. It could be used as a Father’s Day card or a Birthday card for Dad. Some tips for using fun craft embellishments — like ribbons and eyelets — to make a Mother’s Day card or Birthday card for your mom. These card ideas for mom can be used for many different occasions. With a few simple cuts, you can turn an simple handmade Graduation card into a gift card holder for your favorite graduate! Follow these steps, and choose your paper colors based on the graduate’s high school colors, or the colors of their new college. 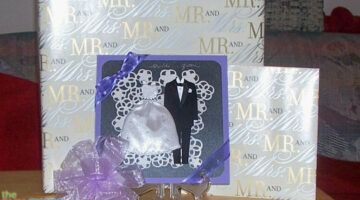 I have 2 Easy Scrapbooking Calendars that I picked up on sale several years ago. Whenever I need a quick and easy handmade card, I check out these pages. 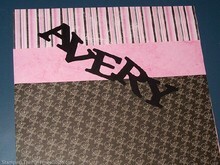 They are designed to be used on scrapbook pages, as embellishments or photo borders. 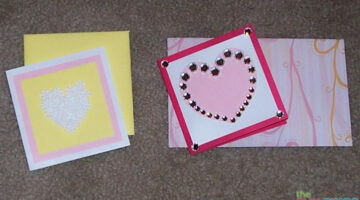 They are also perfect for making cards! 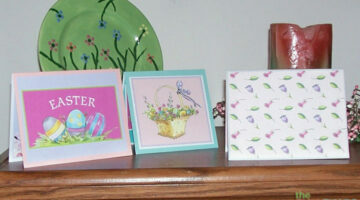 Here are 2 handmade cards you can make for Mother’s Day or to celebrate any girl’s special day, including a Birthday. 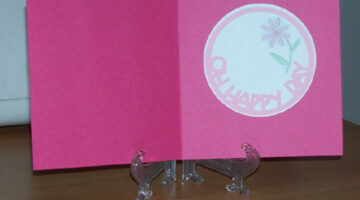 These flowery and girly cards are simple to make yourself! 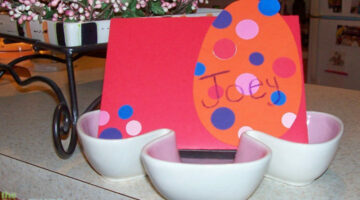 DIY Sweethearts Candy Card With Conversation Hearts: A Fun Valentine Card! Remember Sweethearts candy? Or conversation hearts? 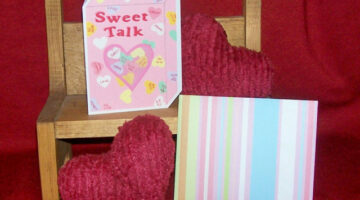 Here’s how to make adorable Valentines cards to look like those fun candies! When I saw this cute reindeer sticker at Hobby Lobby, I knew he belonged on a Christmas card. I pictured him peeking in on my Christmas day, and now you can too. The same could be done for any type of character sticker. 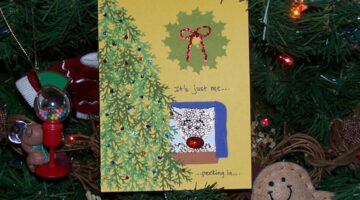 I call this my reindeer Christmas peekaboo card. Here’s how to make it! 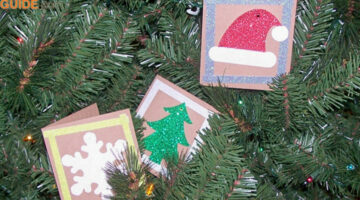 Looking for DIY handmade Christmas card ideas? 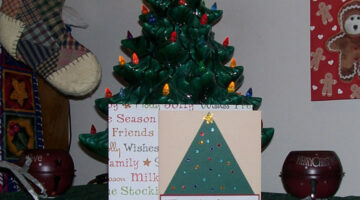 See how I made this easy Christmas card. It features a Christmas tree and fun word phrases. What’s nice about this style of handmade card is how flexible it is. It could just as easily be a birthday card or simple note card. I’ve had an idea for a trick double scoop ice cream cone Birthday card, and here it is. At first glance, it just looks like a regular ice cream cone. Then you pull up on the cherry and — surprise — you see a second scoop! Need a ‘sweet’ handmade birthday card? This one is fun! I made this card entirely from my Cricut Expression machine, using Plantin Schoolbook for the words, and my new favorite cartridge — Everyday Paper Dolls — for everything else. That cartridge cuts out so many things! See why I love it. Are you looking for a unique graduation card for someone special? Thanks to designer papers, you can find a wide array of sentiments, designs, and colors that will make your card stand out from all the rest. See how I made this graduation card. 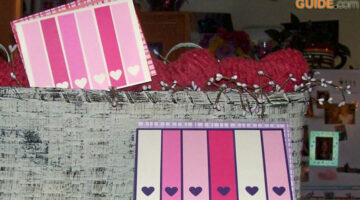 Do you need a card for a special person? Try this unique ‘name’ card to let someone know that you’re proud of them. 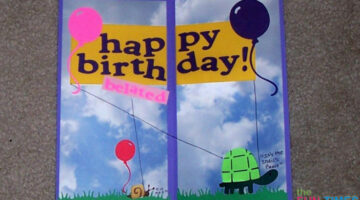 I love making personalized cards for kids with uncommon names, and the sentiment inside can be for any occasion.